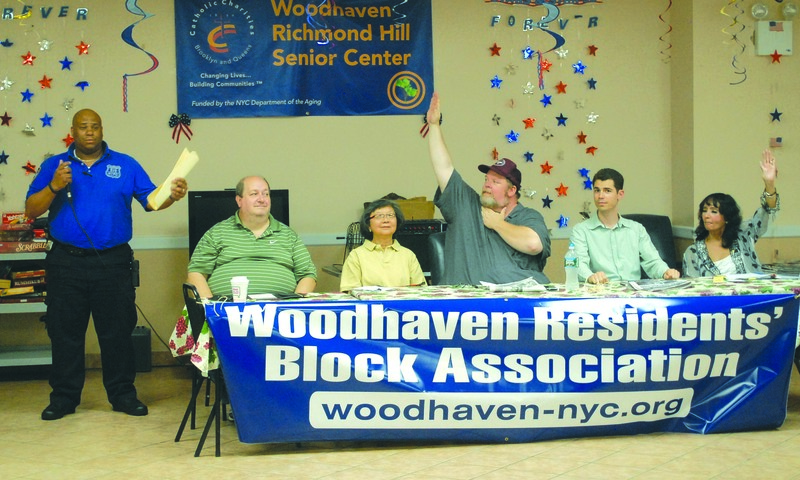 Woodhaven Residents’ Block Association board members ask Police Officer Jose Severino about the 102nd Precinct’s crackdown on noise complaints. Forum Newsgroup photo by Jeremiah Dobruck. Cops in Woodhaven say they’re tightening enforcement on noise complaints, and residents are running their own crackdown on graffiti. 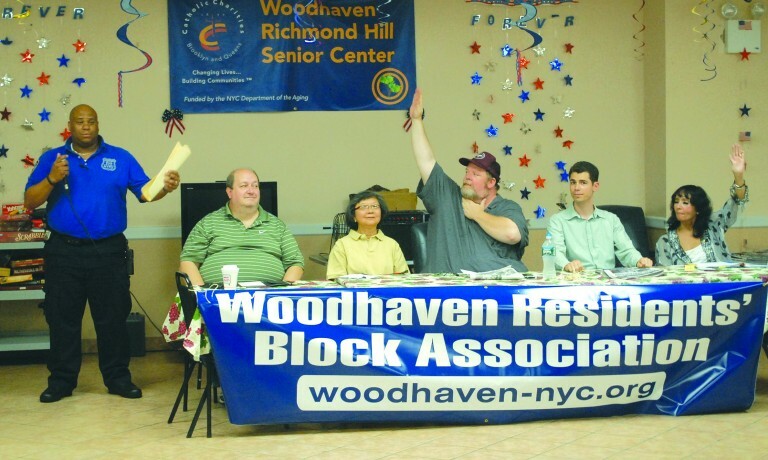 At the Woodhaven Residents’ Block Association (WRBA) meeting on Friday, the 102nd Precinct gave an update on their ongoing battle against noise. The Precinct has begun partnering with other city agencies and levying more fines against chronic offenders. According to said Police Officer Jose Severino of the 102nd Precinct’s Community Affairs division, a chronic noise offender is any location that receives four or more complaints in a month. Mostly they’re private residences constantly bugging neighbors, he said. Now, it is precinct procedure is to send a supervisor to those chronic locations and write a summons without warning. With the help of the 102nd Precinct and Councilman Eric Ulrich, the Department of Environmental Protection conducted an operation to penalize those chronic locations. DEP inspectors with decibel meters visited a clutch of sites on July 14. With those meters, they were able to measure ambient noise levels and have measurable proof when someone is violating a noise ordinance. Those violations run $350 or more, a representative for Ulrich noted. Meanwhile, residents have waged their own war against another nuisance: graffiti. 44 percent of mailboxes were tagged, said Ed Wendell, the group’s president. So, this month, he got together a group of people, and in one day, they repainted all the mailboxes. Wendell’s and the WRBA’s mission isn’t ending there though. He said because the mailboxes had just been freshly painted, it was easy to touch them up to cover the graffiti. “To get it back to 100 percent clean, it took three of us an hour and 9 minutes. And most of that was spent in the car,” he said. That revealed how plausible it is to keep the community’s mailboxes graffiti free. He said the group has also started taking pictures of the tags to hand over to police. As they’ve kept track, the WRBA found out it’s mostly a variation of two tags found on all the boxes. “They don’t really have us outnumbered like we sometimes think they do,” Wendell said. The WRBA also conducted an experiment on how 311 handles complaints. Members called in about a dozen illegally posted signs mostly in Richmond Hill and measured how the Sanitation Department responded. “This is something that’s been a pet peeve of ours that we’ve been pursuing for quite a while and trying different approaches just to see if we can finally get this one problem out of the way,” said Alex Blenkinsopp. Blenkinsopp said sanitation responded to all the locations within three days and the complaints were marked as resolved in the 311 system. The problem, though, is that in seven of the 12 cases, the signs called in were still there after the complaint was closed. Blenkinsopp said often, the Sanitation Department noted they could not find the offending sign. After speaking with 311, he said the problem may be the way a complaint is reported. He said it’s more helpful to report an exact address where the sign is posted as opposed to a cross street. The WRBA will be conducting another experiment to see if that helps. “We’re still working on ways to get to the bottom of this problem,” Blenkinsopp said.